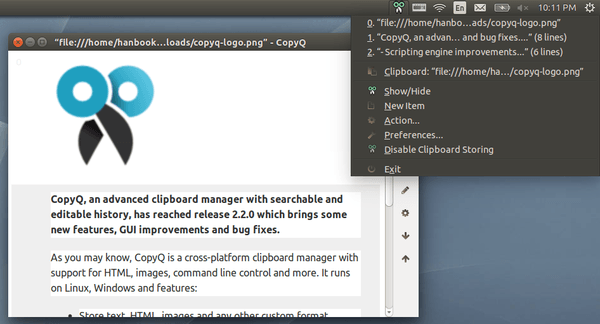 CopyQ is an advanced clipboard manager available for both Windows and Linux. It allows you to browse, search, and edit clipboard history in text, HTML, images and any other custom format. The software provides a customizable system tray menu, supports a variety of system-wide shortcuts (e.g. show main window or tray, edit clipboard, copy next/previous, paste as plain text), sorts items in tabs or tree, and provides advanced command-line interface and scripting. That’s it. For documentation, see the CopyQ wiki page. CopyQ, an advanced clipboard manager with searchable and editable history, has reached release 2.2.0 which brings some new features, GUI improvements and bug fixes. Save items in new tabs. 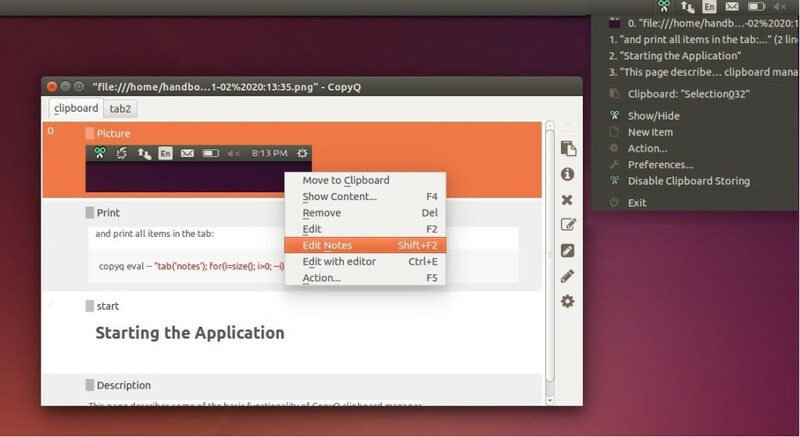 Apply custom commands on selected items or automatically when new matching clipboard content is available. 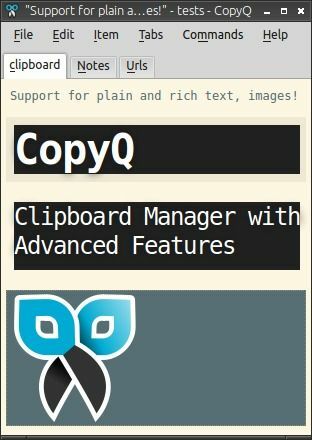 CopyQ is an advanced clipboard manager with searchable and editable history, and with support for text, HTML, images and any other custom format. The installers for Ubuntu 13.10, Ubuntu 13.04, Ubuntu 12.10, Ubuntu 12.04, Debian, OpenSUSE, Fedora now are available in sourceforge.net. Download the package for your OS and double click to install CopyQ. Once installed, open it from Dash or Menu.